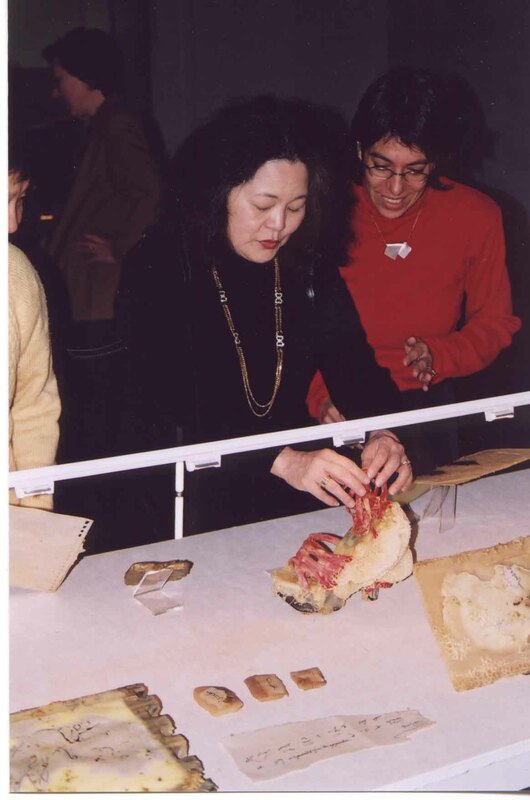 ABOVE: Shoko Tsuchi touches a work by Aganetha Dyck. Also shown is curator Serena Keshavjee. The following essay is by Serena Keshavjee. In 1972 the thirty-five year old Aganetha Dyck moved with her family to Prince Albert, Saskatchewan, which provided her with the opportunity to do volunteer work in a small community. Dyck, who had no previous involvement with the arts, chose to help out at the community Art Centre and spent time chauffeuring and feeding visiting artists and curators. Thirty years later, at a time when Dyck is heralded as one of the most important contemporary artists in Canada, this encounter sounds fortuitous. Dyck's artistic anecdotes often do contain remarkable elements of chance, yet one soon realizes that Dyck's creativity and her interest in artistic technique have been percolating for her entire life. Describing her youthful years growing up on a farm outside of Winnipeg, she notes that someone around her was always working with handicrafts, although the objects produced were understood not as folk art, but as functional things of a practical nature. In part because of her Mennonite background, and in part because of the constraints of rural farm life on the prairies, Dyck has maintained a life-long interest in the processes of fixing, mending, sewing and canning, as well as exploring things. Her first art works of the mid-1970s were made by shrinking wool sweaters and setting them up like figurines. Soon after she took out a bank loan in order to buy a warehouse load of buttons that she set about to cook, can, and transform in any way she could. After that Dyck asked those who were struggling to quit smoking to send her their last cigarettes, which she exquisitely embellished and displayed as art. In 1991 Dyck found a source for making art that combined her preferred modus operandi of process and chance: the beehive. Once again it was a fortuitous event, this time a visit to an apiary to buy wax for her canning objects, that introduced her to the complex society of bees. As apiarists know, foreign objects placed in the hive are immediately covered over with wax and honeycomb structures. Dyck was struck by the bees' determination to make these unwanted objects more familiar by covering them with honeycomb, and she began putting unlikely objects into the hive to see how they would be altered. Dyck always gives credit to the bees, even calling them her collaborators, and indeed to a large extent she does give up control when she places an object in the beehive. The bees do their work in the summer months and in September she removes the objects from the hive. Once the bees are finished Dyck will not change a piece. A cool summer, for example, can completely reduce the bees' usually fanatical work habits and leave the art only minimally decorated. The bees are given the final say, and that, so to speak, suits the artist's modest manner very well. Initially Dyck was struck by the beauty of the honeycombs and the ingenuity of the bees, and she placed everything she could find into the hive, including shoes, purses, hockey equipment and, most spectacularly, a large dress-shaped piece of glass. (Glass Dress: Lady in Waiting, 1995, National Gallery of Canada) Her studio abounds with second-hand objects which have been transformed from junk into art through the bees' alterations. Recently the interventions have decreased on Dyck's part and more allowance has been made for the bees to react with less stress, as her objects get simpler and more natural. This move towards a less baroque display parallels her philosophy, which has shifted from amazement towards trying to understand how bees communicate. Dyck's research on bees extends to reading scientific articles and books, and searching out scientists specializing in bees. In 2001 she met with Mark L. Winston, a renowned expert on bees and pollination at Simon Fraser University, who has contributed the introduction to this catalogue. The meeting was remarkable for the excited and respectful exchange that occurred between these two very different people. It serves as a reminder of how close in temperament dedicated scientists and artists can be. For the installation at Gallery One One One at the University of Manitoba in November 2000, Aganetha, with her son, the artist Richard Dyck, made audio recordings of bees as they worked in the hive. Even more intriguing than their haunting vibratory noise, is how the bees have dealt with the braille and wax tablets that Dyck placed in the hive for this installation. When a bee starts making honeycomb, he drops an anchor of wax -- a wax dot -- almost exactly the same size as a braille dot. The honeycomb structure is then built up from that dot. Braille, a representation of the alphabet created to aide the visually impaired, similarly starts with a single dot. Most sighted people cannot read braille, and according to Kris Owen of the Winnipeg Chapter of the Canadian National Institute for the Blind, only a small percentage of the blind can read braille. (2) It was the coded nature of braille that first attracted Dyck. Illegible scripts have challenged scholars throughout history, the most famous example being the Rosetta Stone, which had the same text in three scripts incised on it -- hieroglyphic, hieractic and demotic. (3) The Rosetta Stone is a honorific stele made in 196 BCE for the Egyptian ruler Ptolemy V. When it was discovered by Napoleon's officers in 1799, it was unreadable except for the demotic Greek script. Years of painstaking work finally enabled scholars to decipher the other two scripts, opening up for the first time in 2000 years Egyptian writing and culture. Dyck is drawn to communication challenges, and included in the Gallery One One One exhibition was a braille translation of the Greek demotic text on the Rosetta Stone. The sheets of braille were given over to the bees, and once out of the hive, these braille and honeycomb sheets were made available to the sight impaired and the blind to read in the exhibition space. The wax dots created by the bees subverted the braille text and in the end, almost as if hieroglyphics had never been translated, neither those with sight nor those without were able to fathom the precious text of the Rosetta Stone. The goal of the Romantic art movement 200 years ago, and of the Neo-Romantic, Symbolist movement at the end of the nineteenth century, was similar to Dyck's, that is to attempt to represent a nature suffused by this élan vital, and ceaselessly transforming itself. These nature-centric movements were trying not to represent nature in a static manner, but to depict it in a state of "becoming." Like Maeterlinck and Rudolph Steiner, quoted at the beginning of the essay, Dyck functions within the Romantic tradition whereby codes and patterns are signs of deeply hidden qualities and affinities between humanity and nature. The selfsameness of the hive and the universe attracts Dyck, and the honeycomb sculpture she offers us, is in many ways meant to be the "cipher... through which Nature speaks figuratively to us in her beautiful forms. "(12) But Dyck lives in the twenty-first century and unlike the nineteenth-century utopian search for the hidden knowledge which Nature could reveal to us, she knows there is no universal knowledge to be found, even if she could translate the honeycomb crust. Just as most of us cannot read braille, so it will remain that we will be unable to read Nature's script and the dance of the bee will remain mysterious to us. But, if the all-too-human desire to decipher nature remains illusive, Dyck's action and her art demonstrate another more general way of communicating with nature. Dyck, like many others before her from Maeterlinck to Steiner, has illuminated metaphors to help understand human society, and perhaps more importantly, has reminded us of our place in the natural society. l. Rudolph Steiner, Nine Lectures on Bees (1933: Spring Valley, N.Y. St George Publications, 1964):5. 2. Kris Owen, Director of Communications and Volunteer Services, interview, September 2000. 3. Marilyn Stokstad, Art History (New York: Harry N. Abrams, 1999): 113. 4. Quoted in Meeka Walsh, "The Incredible Lightness of Bee-ing" Border Crossings vol.19, no.2 (May 2000): 45. 6. Mark L. Winston, The Biology of the Honey Bee, (Cambridge, Mass. Harvard University Press, 1987):1. 7. Maurice Maeterlinck, The Life of the Bee (1928: Dodd, Mead and Company, 1950): 18. 9. Henri Bergson, Creative Evolution (1907: Lanham, MD. University Press of America, 1983):166. 10. Shirley Madill ed, Aganetha Dyck (Winnipeg: Winnipeg Art Gallery, 1995):22. 12.E. Kant, Critique of Judgment, 1790, quoted in Hilmar Frank, "Arabesque, Cipher, Hieroglyph: Between Unending Interpretation and Loss of Meaning," The Romantic Spirit in German Art 1790-1990. Edited by Keith Hartley (London: Thames and Hudson, 1994): 147- 154, quotation 148. Hilmar Frank describes "ciphers" as naturally occurring visible signs reminiscent of hieroglyphs that point to the invisible.